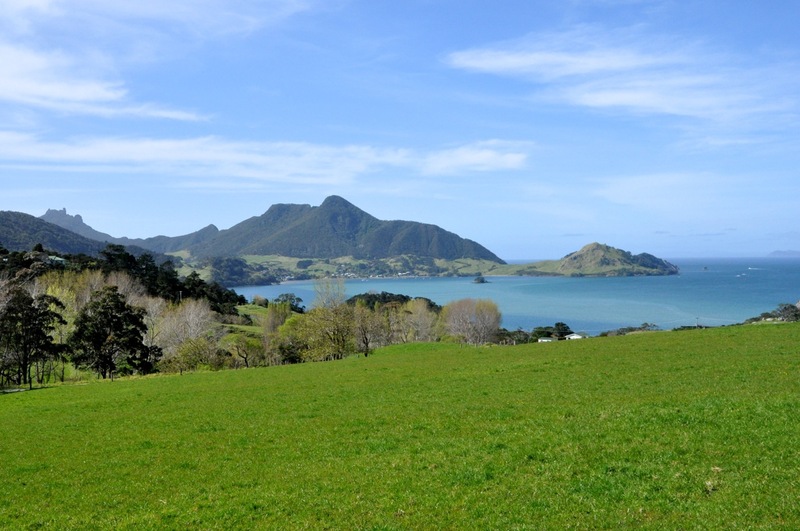 I wanted to climb one of the small mountains on a headlands, and Whangarei Head looked like a good place. Besides, the area has some wineries worth visiting (our version of multi-tasking). We found a good-looking B&B on the internet, but y’know, those sites often don’t give you the full story, as we have discovered quite a few times. The surprise with this B&B was getting to it; we had to travel on a narrow, twisty, steep, cliff-edge, white-knuckled road, much to Ginger’s dismay. Even then, the gravel, rutted, pot-holed up-and-down driveway to the B&B was a challenge. Once we arrived at the B&B it was quite pleasant, and certainly quiet! However, the specter of doing that drive twice a day was a bit daunting – and going out for dinner meant returning at night. This travel stuff is always exciting, requiring a certain amount of stiff-upper-lip fortitude, and maybe a good sense of humor. The picture is the view from the B&B’s back yard (notice we’re high up?). The peak with the jiggles on top, just left of center, is the one I’m going to climb tomorrow – Mt. Manaia. Ginger, bless her heart, has decided to accompany me on the mountain climb, but we miss the trailhead turnoff and end up at Ocean Beach on the other side of the little peninsula (I realize we’re on the wrong road, but there’s no easy way to turn around on the narrow road, and besides we’re exploring). Not a bad little beach, eh? They’re a dime a dozen, and at least for this time of year they’re lonely, looking for love. But we have hiking to do, so back we go. Between us and Mt. Mania is a promontory, Busby Head and Smuggler’s Cove, reputed to be scenic, so we decide to hike here first. That little chunk of land with a hill on it, protruding into the bay, is where we’re hiking. It’s a nice, sunny day – rare for us! And the hike is very pleasant, with lots of birds to see. 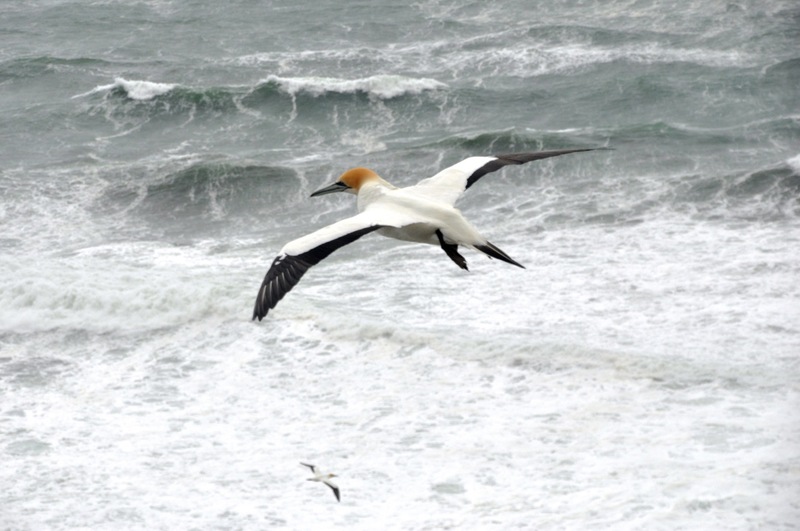 Swallows zipping by on the ocean breezes, impossible to photograph – they’re haulin’. I’ll show you some birds I did manage to catch a bit later. Pictures of the hike follow. Here are the birds, or at least some of them. 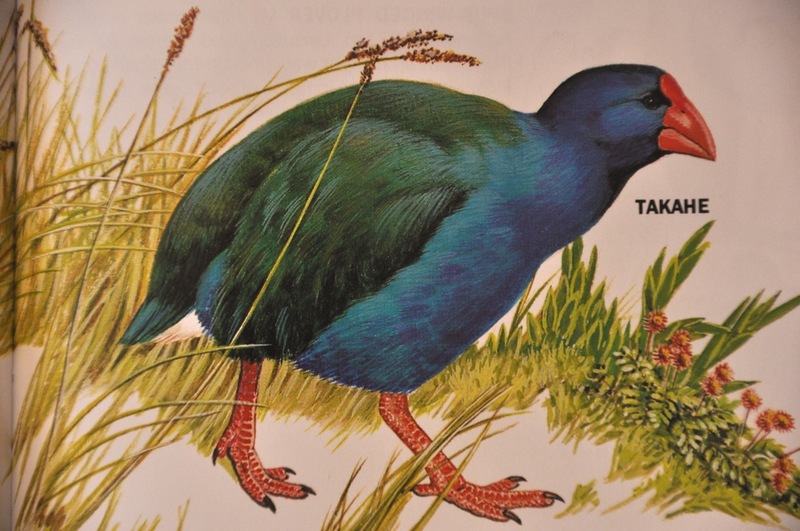 Some you’ve seen already – Pukeko and Tui are everywhere, but I don’t need to show them again. Others I haven’t identified yet, but hey, there’s enough here to keep you entertained, yes? So now on to Mt. Manaia! On, on! I have twisted my ankle on Busby Head by stepping into a hole while walking off trail beside Ginger, but I will not be deterred! It’s the same ankle that I sprained in Brussels, where I walked miles on it every day, and it was just now getting better (it takes longer to heal at this age, I note). The trail marker says the hike is very steep and will take 2 hours round trip, and Ginger decides she has had enough hiking and that only an idiot would do that climb with a sprained ankle. Yep, she is right. The trail doesn’t start out that steep. I meet a couple of people coming down the trail, but it’s late afternoon and I am all alone now. It’s a pretty trail, and it is increasingly steep. 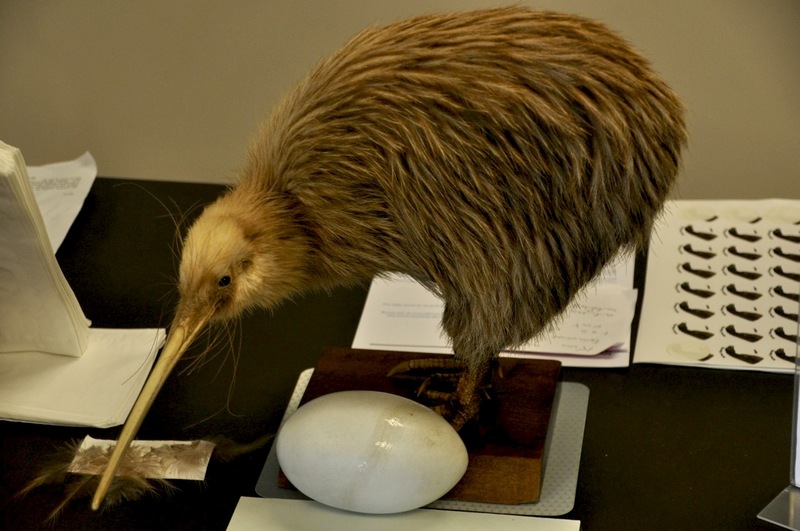 The Dept of Conservation (DOC) here is amazing. The parks and hiking trails and bird sanctuaries and mammal pest removal programs are everywhere and done very very well. I wish we had trails like these at home!!! They’re gorgeous, well-maintained, I could say perfect. On this hike they have installed what seems like a million wood stairs going up this steep mountain. A little wierd; I came here to hike, not climb no stinkin’ stairs! But then I get it. Brilliant! The switchbacks that we would have had in the US would have made this hike about 3 times as long, with all the erosion problems inherent in switchbacks. These stairs have a water channel on one side leading to pipes going under the trail. Impressive. More pictures of the trail, above. That tree in the middle is a kauri, growing all by itself. The last image shows 3 stair sections going up, the last one maybe lost in the sunlight, top of image, center. The trail is steep! view is NOT 360. There are vertical stone outcroppings that block the view front and back (those “jiggles at the top” I mentioned in the initial picture from the B&B), and moving around them is impossible – the end of the climb is a small piece of slanted rock with a steep drop all around, the wind is blowing like crazy, and the sign says if you even try to get around the crags you are trespassing on sacred Maori land. Nevertheless, the view isn’t too bad, eh? On the way down, there is a small unmarked side trail that I had noticed going up, and I take it, and it leads to an outcropping that has even better views. 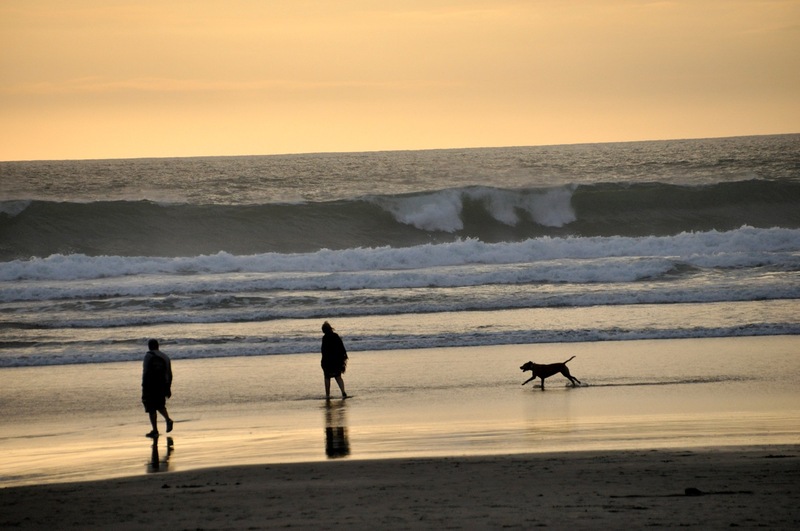 The picture on the right shows that Busby Head again, where we took the earlier walk. I am pleased that I make it down in 1 1/2 hours, a bunch less than posted. Now to look like I’m not limping when I approach the car, otherwise I’ll get an “I told you so, idiot” from my adoring wife …. 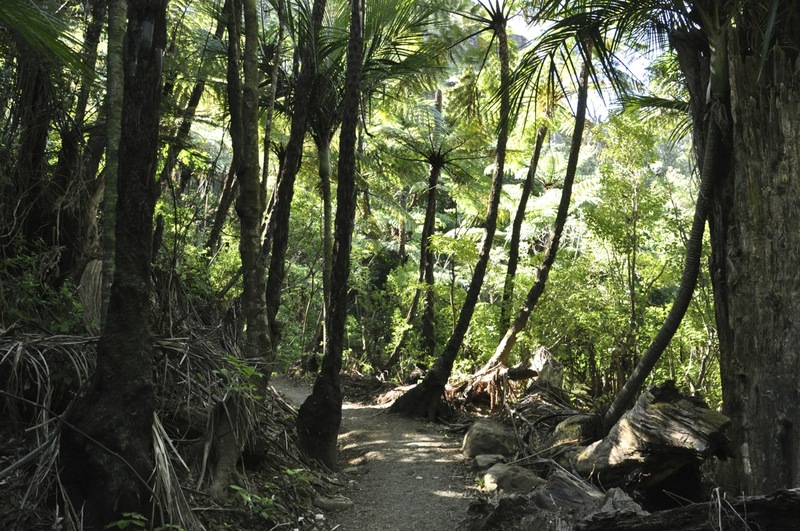 We’re off to see some Kauri, the world’s 2nd largest trees. 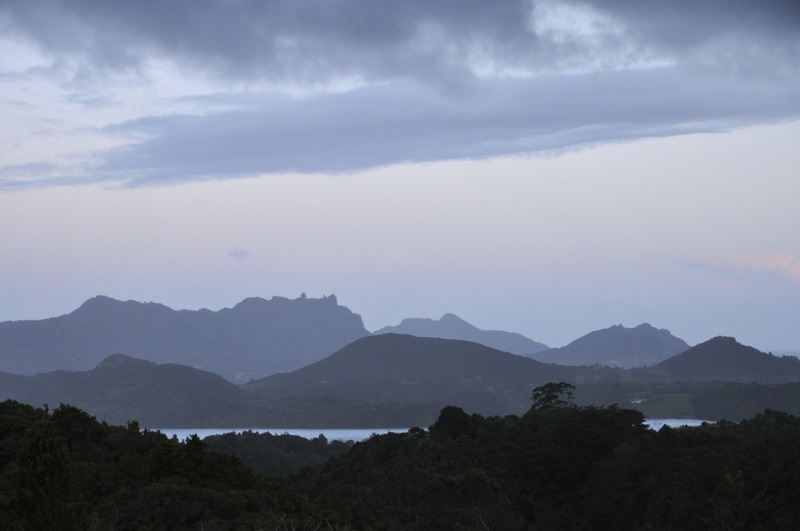 With some regret we leave that gorgeous apartment in the Bay of Islands, home for 10 whole days. Quite a luxury, that length of time in one spot, but it was some good R&R and allowed me to get this blog functional, finally. 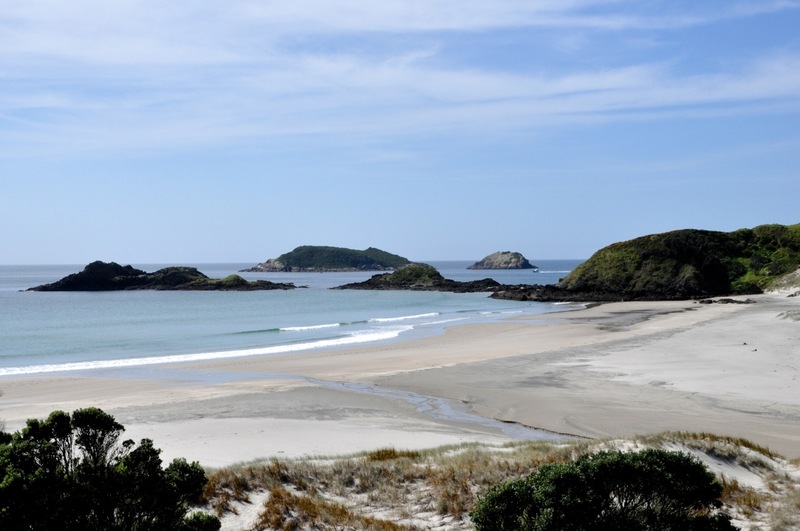 I’ve shown you a few pictures of the gorgeous Northland in earlier posts – green green green, impossible shades of green, rolling hills to mountains or ocean. 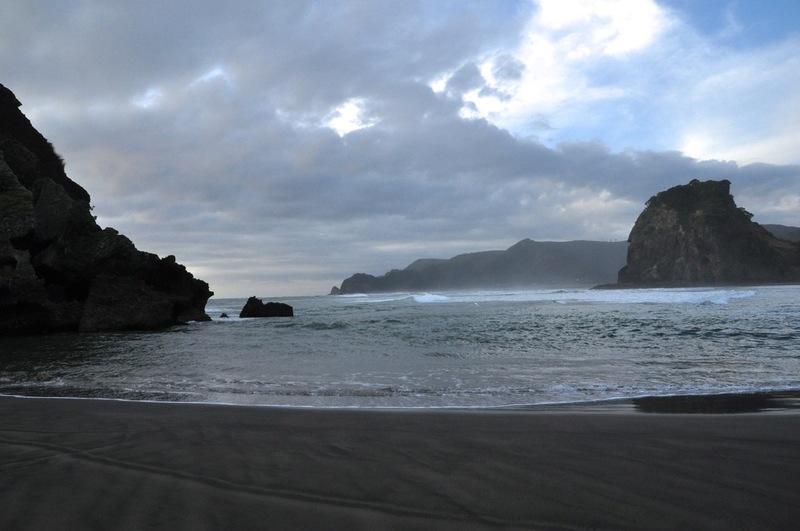 It’s really spectacular, and yet we know it is not the prettiest part of NZ. Save the best for last, they say. 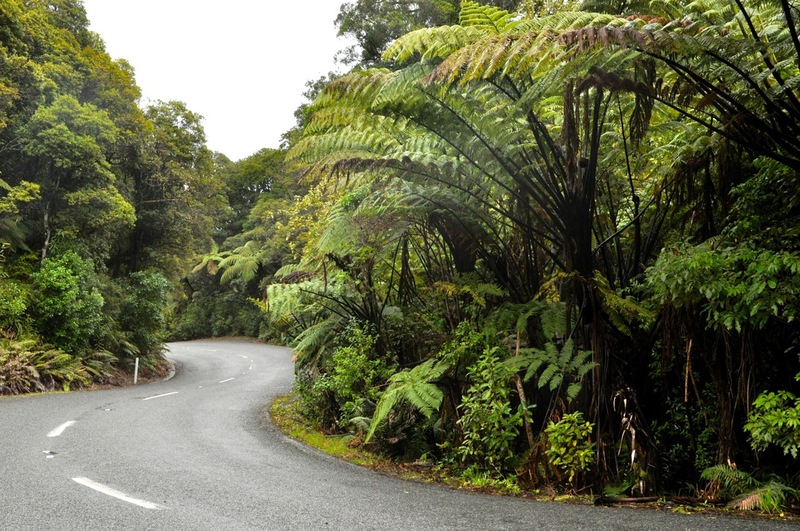 Let me show you the journey to the Waipoua Forest before I tell you about the Kauri. Ladies and gentlemen, the land of sheep and cows. I can’t leave you without a picture of NZ’s most numerous resident, can I? They’re everywhere, dotting the landscape as beige blobs on a green background. Cows too, in this neck of the woods, but they’re less photogenic. 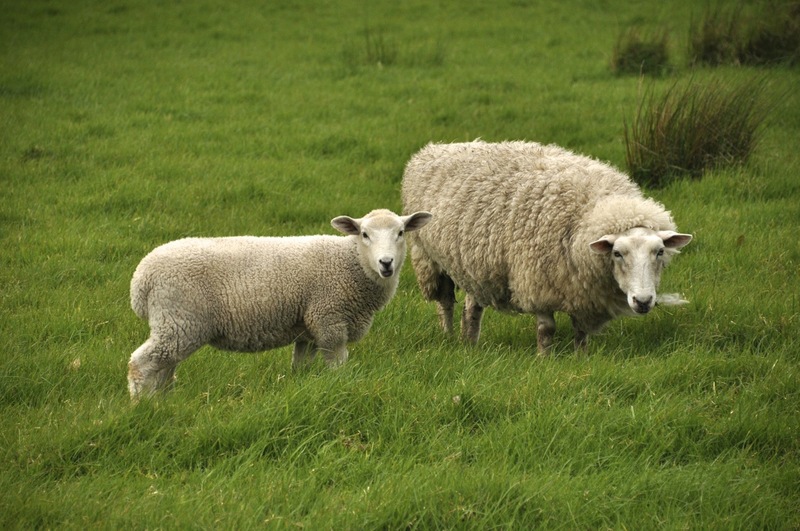 Apparently many residents outside the cities use cows or sheep to cut the grass. No need for a lawnmower. This was the case for the B&B we’re headed to, but a part of me thinks of the ditty about the little ol’ lady who swallowed a spider. I’m betting the lawnmower is less work. far from water! Here are a couple shots from Hokianga Harbor. 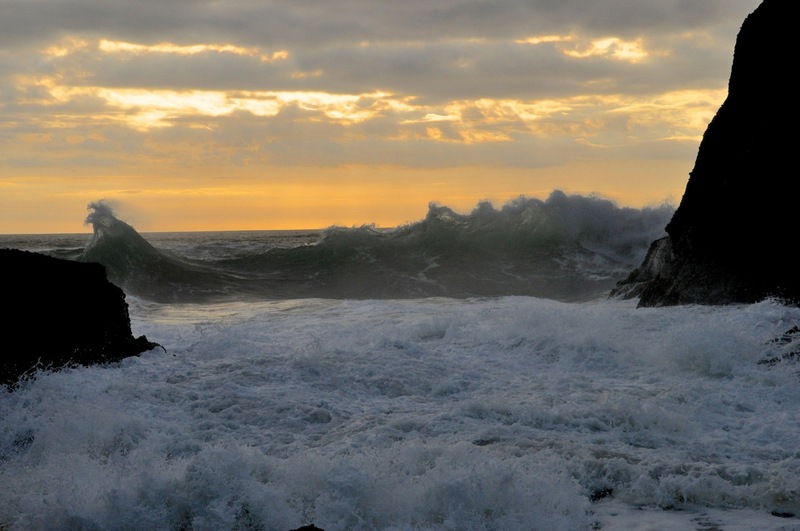 Looking out to the Tasman Sea, the incoming waves are ferocious, true for the entire west coast of NZ. The smaller images look across the harbor to (big) sand dunes. OK, on to the kauri. Today they only survive in NZ. The Northland and regions slightly lower were once covered by these magnificent pine trees. They can live to be 2000 years old, reach 150 feet, and be 60 feet in diameter. The Maori used smaller kauri for their war canoes that could hold 100 or 150 fighting men (and a village didn’t need too many of them!). Then the Europeans sailed in. The trees are straight as an arrow, and the Europeans saw the younger trees as perfect for tall ship masts. Later, the straight-grained, durable, blemish-free, easy-to-work and beautiful wood dominated the NZ economy, supporting many cities. Getting those monstrous logs down to sawmills was quite a challenge, and Northland still has remnants of small dams (some 60 feet tall) that were built and then demolished to send these trees crashing over waterfalls and down mountains. By the early 1900’s, the trees were almost all gone (and with them, the economies of most of Northland’s cities). 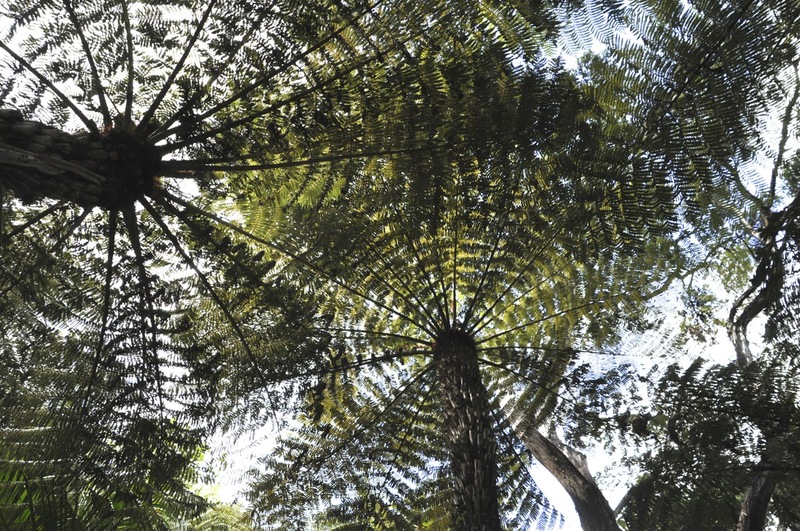 75% of all surviving mature kauri trees exist in just two forests, together covering only 60 square miles. 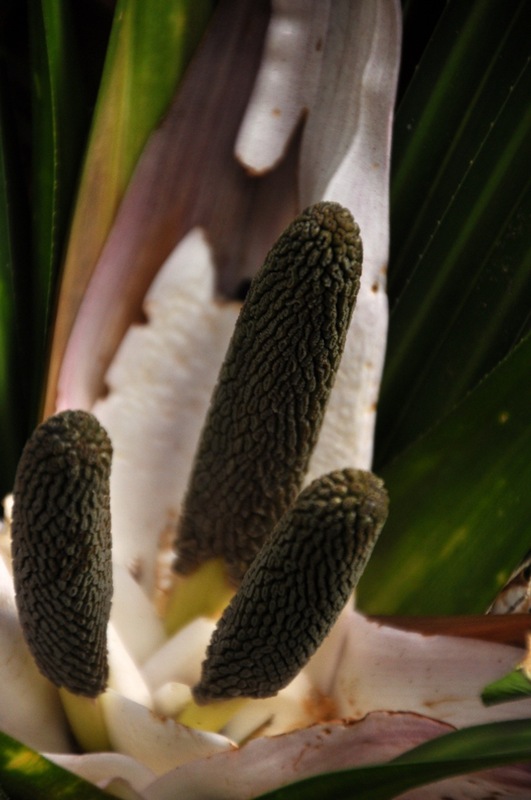 The Waipoua is one of those and has the oldest kauri. The biggest boy is about 2000 years old and has a name, Tane Mahuta (Maori for “God of the Forest”). I’ll show him to you a bit later. The forest is fascinating, with moss everywhere and epihytes everywhere else (epiphytes grow on trees but get nutrients from air and rain). I’ve seen epiphytes before, but not where they totally obscure the bark of a tree, all the way up! They are varied and beautiful. Something that resembles Staghorn fern, or maybe it is Staghorn fern, is frequently seen in the trees. The kauris are magnificent. They have a whitish bark, the younger ones look like growing telephone poles, and branches do not occur until you have craned your neck ‘way back. 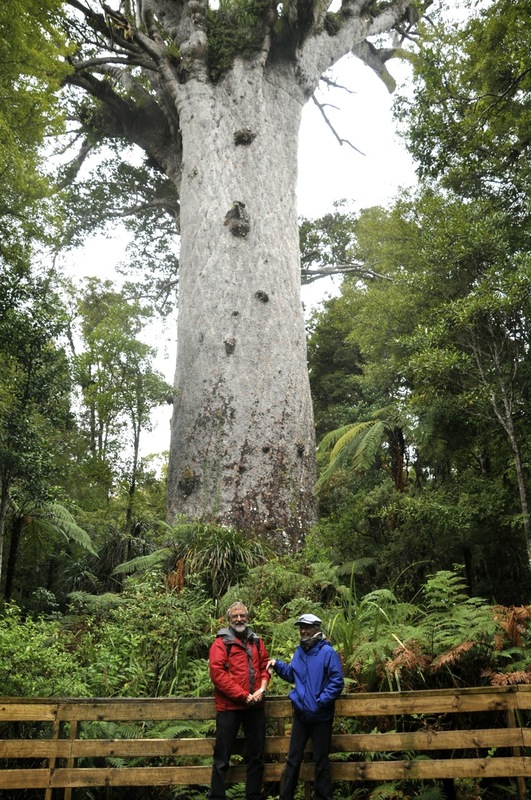 The big guy (picture to side) is, of course, Tane Mahuta. Others are also quite striking, as shown below. I confess, I think the California Redwoods are more spectacular. For me the redwoods have a cathedral-like quality to them, and I feel a quiet reverence in their presence. They are also more numerous and taller, and pretty much all by themselves; you are surrounded by the pillars of that cathedral. 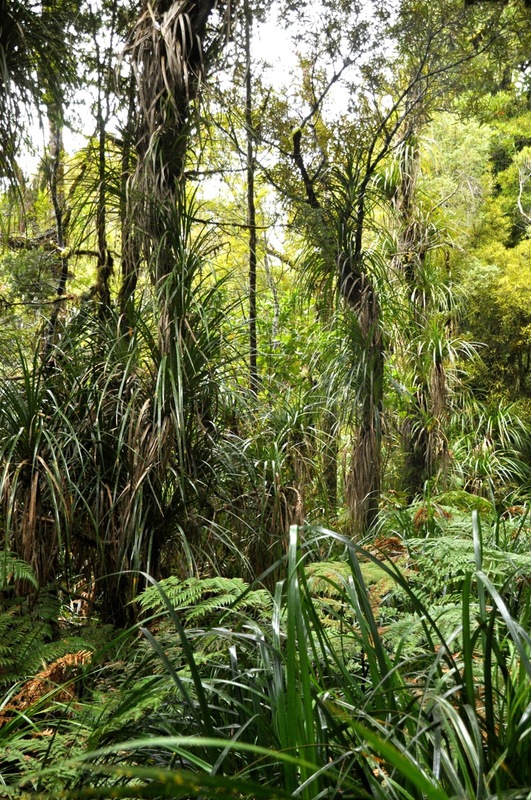 The kauri, on the other hand, are here and there and surrounded by a riot of almost-jungle. Nevertheless, the kauri are so very old and so very massive, yet still so very beautiful, and the thought that they were almost eradicated from this world in order to make a buck is sobering. Respect your elders – isn’t that a Maori prinicple? Pictures below.